This is the final installment of a four-part series. If you’re just joining in, here’s the first, second, and third installments. The Arch is massive up close. While exploring the periphery, I noticed the Hyatt across from the park. If you look carefully, each of its towers’ side rooms have windows that are angled to face the Arch. The rooms inside must have a slant to them to provide as many rooms as possible with an unobstructed view of the Arch. Makes for a great pic right from your hotel room, I guess! The entire Arch was surrounded by a low, brightly-colored, plastic construction fence, presumably to keep people away from going underneath the Arch or because they had some kind of lawn treatment going on. While I was resting my legs, a Park Ranger’s patrol car came rolling up, toggling its siren every couple seconds. The Ranger got out of his car and pointed to the other side of the Arch. There were maybe a half dozen high-school aged kids who’d crossed the barrier on the other side and were strolling carelessly along. The Ranger shouted at them to turn around. They didn’t. The Ranger climbed over the plastic barrier, his hand firmly on his hip holster. He called out again and pointed. They still didn’t move. Passerby were watching to see what would happen. After an inaudible conversation that lasted about a minute, the youths retreated, though not before we all thought they were about to get themselves arrested. More than tired from the walk, I was hungry and thirsty. Although my hunger had abated from earlier in the morning, it had returned now that the clop-clop-clop of my feet wasn’t distracting me. It was about 2:00 PM, and I had to be back at the airport about 4:00 for a 5:30 flight, so it was about time for some lunch. Before I left, though, I wanted to see what was beneath the Arch. I approached what appeared to be a ticket taker at the entrance to the underground compound and asked him what was down there. He politely advised me that there was a souvenir shop and some exhibits; I asked what I assumed would be a futile question: “Are there any more rides to go to the top?” He kindly repeated a response I’m sure he’d given all day, and perhaps all year. “Nothing for the rest of the day.” Eh, it would have been time consuming and expensive. That’s it. No big deal. I’m over it. It’s fine. Off to find some vittles! Thankfully for me, I already had a place in mind that came recommended. My father, who’d introduced me to a number of great restaurants in Louisville and abroad over the years, had been in St. Louis for a writer’s conference just a couple weeks before I went, and his suggestion for lunch was a place called Caleco’s, an Italian sports bar kind of place close to the Arch. Right at the corner of Broadway and Chestnut, Caleco’s looked like a local favorite. I went in and got a seat at the bar; when I’m by my onesie, I don’t mind grabbing a stool. The bartender, a friendly guy probably not more than a year or two older than me, took my order. What was I in the mood for? Pizza? Well, that’s always a winner. I asked if he had any local pale ales on tap, and he obliged with a list of what he had on tap, including the favorite local brew, Bud Light. I chuckled and he looked surprised; he told me most people don’t get that joke, which in turn surprised me. Instead, I got a Schafly Pale Ale, a more well-known local brew you can actually get in Louisville at many liquor stores. Before I knew it, I’d downed half the beer and promptly asked for a glass of water in addition, realizing that chugging a beer after 15 miles of hard walking pretty much punches my ticket to Sicksville. He had my food up in a jiffy, though, and it was a fine lookin’ pizza! I veritably inhaled my pizza, justifying my unhealthy lunch with the satisfaction of a lengthy, calorie-burning walk. A couple sitting around the corner was talking with the bartender about the big marathon being held in the city tomorrow and the 10k in which they were running that afternoon; apparently, the lady always has a beer before a race, which sounds awful to me, but there you go. Overall, I’d give Caleco’s an 8.5 out of 10; not revolutionary, but thoroughly solid with good service. A bit pricey, too. Anxious to get on my way to the airport, I paid my tab and started out. I’d had my entire meal, from sit-down to the door, in about thirty minutes, so I actually had a few minutes to kill before my 3:00 planned return trip to the airport. I wandered back the way I came and spotted several other famous St. Louis landmarks, namely the St. Louis Cardinals’ Busch Stadium. After a disappointing postseason, Busch Stadium was uncomfortably quiet. The bartender had told me that, despite St. Louis’s multiple professional teams, the Cardinals were the only ones anybody really cared about. The NFL’s Rams hadn’t done well in a while, and I have no idea about the Blues’ record in the NHL. In general, actually, I found the whole downtown area pretty quiet. It wasn’t teeming with tourists except at the Arch, and in general, lots of the buildings looked pretty well rolled up. Admittedly, during a weekday, I’d say it’s as busy as any other Midwestern city, but today, I was surprised at the peace, especially given the pleasant fall weather. Perhaps the national coverage of riots and demonstrations in defense of Michael Brown have shooed away the fearful. Between you and me, I kind of wanted to see one myself. This kind of thing is history in the making, both locally and nationally. Although I’d actually planned to take the MetroLink at the 8th and Pine station, closer to Caleco’s, there was actually a station right here at the stadium, aptly named “Stadium.” While certainly not as complex or interesting as a light rail station in New York or Hong Kong, it was nice to see how low-profile it could be, much like the Rock Road station I’d encountered that morning. I was getting my ticket at the automated machine before descending to the train level. A man approached me and kindly asked if this train leads to the airport. I told him that it did, and he seemed grateful. We got our tickets and wandered down to wait for the train. We struck up a conversation; his name was Vince, and he gave away his nationality not with his words or physical traits, but through the clothes he wore. He was wearing a bright red Spanish football club warm-up suit. I asked if he was from Spain, and he confirmed that he was. As the train came rushing to the platform, we considered whether this was the correct train for us, decided it was, and hopped on. Although signs abounded saying a conductor would come by to check our tickets, no one ever did. As the train lurched back into motion, he told me that he was in town for the marathon as well, and that he’d had a good run that morning in one of the shorter side events. I joked with him, saying I was about to brag about my 15-mile walk to him, now realizing that it looks pretty juvenile compared to a 26-mile run. He was a Spanish teacher who’d taught his native language in Iowa for the last several years. Suddenly, I realized we’d gotten on the right train, but it was terminating at the wrong place. I gestured to him for us to stand up and exit, and we did so just in time. We sat at the platform and continued our conversation; he expressed his displeasure with the way soccer/football players are compensated, saying that giving so much money to these young men was foolish. I agreed, citing the exorbitant salaries of MLB players as an analogous American problem. I brought up the legendary home run race from my youth, where St. Louis local Mark McGwire and Chicago Cub Sammy Sosa dueled for the fate of the home run record, made some forty years earlier by Roger Marris; as baseball isn’t much of a sport outside of the US and places like Japan, this whole event was news to him. Eventually, the right train rolled into the station and we hopped on, bound for the airport. We rolled along in the new stock, stopping every couple minutes to admit and discharge passengers. After a couple of stops, we passed Rock Road, where I’d been just hours earlier, trudging along on my journey, unaware of the things I’d encounter between then and now. After passing the local university stops, Vince disembarked. We shook hands, and I wished him the best of luck in the marathon the next day. I relaxed my eyes and let myself by swayed by the train’s course. The airport was a long-distance stretch from the next-to-last stop. We finally came to a halt at the final location, and I gathered my backpack and headphones. The gentleman behind me was fast asleep. I’m not sure where he intended to get off at the final stop or if he was just riding it for a couple hours, but I stirred him awake in case he wanted to get off. An enclosed escalator took me down to the lobby level of the airport, where I emerged in a neat little terminal. The swooping ceiling was unique; it swung low, making me feel like I was in a painted cavern more than an airport terminal. I wandered over to the small Cape Air counter and checked in. Maybe my weight will have changed? Eh, wishful thinking. Now officially checked in and ticket in hand, I set out to explore a bit. KSTL has three main concourses, divided fairly firmly by airline. However, each of the three terminals has its own security checkpoint. The terminals were segregated enough that, once you’d gone through security in one, you were firmly confined to one terminal. As you’ll come to learn, this is very unfortunate for me, as I love to wander through the whole airport while waiting for my own flight, not just in my own concourse. Although I considered going through each security checkpoint separately to explore the airport (I had time), the TSA agents turned someone in front of me away for reporting to the wrong checkpoint. Thus, I was consigned to the same concourse at which I’d arrived eight hours earlier. I sailed through security without a problem around 4:15 and, as I do in any terminal, I started my exploratory walk. Concourse C was a healthy walk, perhaps a quarter mile from one side to the other. On a Saturday afternoon, it seemed fairly tranquil, with a few flights headed out and coming. Several touristy shops lined the corridor, along with some food outlets and vending machines. Just like about any other airport, really. The concourse wasn’t terribly distinct, as this photo might indicate. However, it does have one intriguing bit of recent history to its name. Back in May of 2011, if you’ll remember, Missouri was ravaged by several tornadoes over the course of just a few days. KSTL happened to be directly in the path of a severe, EF4 tornado. That’s the kind of tornado that picks up Dorothy’s house, y’all. As the twister tore across the runways and terminals, glass shattered and planes got pushed around like toys. Structurally, the airport remained pretty intact and it has since been restored. So, although not particularly glamorous, this place is sturdy. I put on my headphones and lapped the concourse several times. There goes a flight to Dallas, there goes another one to Seattle, and here comes one from O’Hare. I even racked up my pedometer to a healthy 40,000 steps. The farthest end of the concourse had been closed from disuse; even in this well-funded and highly-visible area of St. Louis, there was still decay. Deep in the back of the closed section, this former Great American Cookie was being gutted. The lights were on; someone had been working on it. Despite the normally polished interior of the airport, this section had the whole “flickering lights, dimmed overhead lamps, boarded-up doors” thing going on. It felt like a rundown mall more than an airport concourse. Casually, I wandered back to the more populated section of Concourse C, grabbed a snack and a soda from one of the casual cafes, which lowered its metal gate behind me as soon as I left, and resigned myself to a seat at C7. I caught myself watching an episode of Anthony Bourdain’s show where he visited Paraguay. It was difficult to follow, though, as the closed captioning I was relying on seemed to be about thirty seconds behind the action on-screen. The attendant called for our flight number, 1261, and I was ready to go. I lined up, but there wasn’t anyone in front or behind me. I wasn’t on this plane alone, was I? Oh, wait, there she comes. A single other passenger and I boarded the same elevator from this morning and descended to the tarmac. She wasn’t on the flight this morning, so I didn’t recognize her. Her name was Nikki, and she was on her way to Owensboro visiting family from out west. She was about my age, a little younger, perhaps, but this is the first time she’d been on a plane this little, and she was shocked. In we went, and the same captain who flew us in this morning was at the helm again, though this time without his co-pilot. While commercial flights are required to have at least two pilots aboard, there must be an exception when you’re flying just two people. Maybe “three passengers or less” was the cutoff. Our captain gave us the same safety spiel, and I snagged a spot right behind the copilot’s seat. I had half a mind to ask to sit in the co-pilot’s seat, but I chickened out. Either way, I got a great view of all the controls and what the pilot was doing, which made the aviation geek in me happy. He taxied us out just as quick as we rolled in this morning, and he had us on Runway 30L, ready to take off where we’d landed that morning. A pretty sunset was on deck for our in-flight entertainment. I watched the pilot’s hands flurry over the knobs and dials, getting us set up for our flight. Slowly the sun set behind us, and the three of us soared into twilight. Our return flight time was slated to be shorter, around an hour flat, so it wasn’t long before we were descending back through the clouds. I watched as we got closer and closer to Owensboro on his GPS and we were still going nearly full speed. He made a hard left turn, lined us up facing north, and deployed the flaps and landing gear in one motion, bringing us in for a smooth approach. He taxied us up to the unlit terminal in Owensboro, and we disembarked. The same lady who gave me my ticket this morning was there to greet me, and she ran into unlock everything and turn on some lights for us. Through the “jetway” we walked, and we emerged in the terminal, equally as empty as when I’d gotten there thirteen hours earlier. I bid Nikki a fun visit with her family and made my way to my car. In the front seat, I found my directions which I’d indeed left there that morning. A turn of the key and I was on my way home, where I safely arrived about 100 minutes later. What a fun, cheap, and enlightening trip! The day was full of surprises, on-the-fly changes, and fulfilling experiences, just like any trip should be. This trip was one of the cheapest I’ve ever done, and certainly the cheapest that included a flight. Here’s a breakdown of my total travel-related expenses. That’s $165.00 for a full day of fun, some great pictures, and a month of posts! What’s your favorite place to go in St. Louis? If you had just one day, what would you choose to do? Where would you eat, and how would you get there? In February, I'll be doing a walk I've been planning for months, and I'm excited for you to go along with me! This is the third part of a four-part series. To read the first installment, click here. Here is the second installment. Wellston, I would come to find out, is the poorest urban community in Missouri, and it was smack dab in the middle of my path to the Arch. With every step, the buildings became older, more dilapidated, more antiquated. St. Charles Rock Road had transformed into Dr. M. L. King Drive; from there, I turned down the street on my assigned path, and everywhere I looked showcased a condemned, half-demolished building, its storefront rotting or boarded up. The varying state of these structures was intriguing; some appeared to have naturally demolished themselves or had been helped by intentional fire, or even arson. Nothing had been carted away; the building collapsed as it was, and it was to be left there until someone with the money and will to do so cleared the lot for something else. Graffiti was pretty common across the old buildings, but this one was particularly telling. Because it says, “still” on the right portion, it’s safe to assume this was painted back in 2011, when President Obama was running for his second term. Regardless of what you think of Obama, the folks living here were hoping for a change; whether or not Obama had the power to actually deliver it to this community is something else altogether. My directions seemed incorrect, and the distances between my next points seemed wrong. Walking on these side streets made me feel uneasy. The sidewalks were old, cracked, and covered in weeds. Dogs barked in the distance. Sirens blared a few blocks over. My innocent walk had turned down a dark path. I pulled my hood up and picked up my pace. I turned down my next road, which was an alleyless sidestreet. Someone behind me shouted for me. At first, I wasn’t sure if she was talking to her companion (she was walking alongside someone else), but it quickly became clear that she meant me. I was in the thick of a neighborhood. The houses that weren’t destroyed or condemned were actually quite nice, with simple Halloween decorations, but they were the exception, not the rule. Windows were smashed out all along the row. Realizing that my directions may have left out a step, I took an impromptu right turn, hoping to push to a major road again. A car pulled up beside me at a stop sign as I crossed the street, lingering much longer than the traffic laws required. The destitution of the region, in my mind, doesn’t reflect poorly on the residents that live here. It’s important to remember that, when what was once a promising community declines, it becomes increasingly difficult to be mobile. One’s property starts to go down in value, traveling to a job outside the declining area requires more time, money, and effort, if a job is even still available within a reasonable distance. So holding a job is difficult, and so paying your mortgage becomes harder, so you have less money to travel, ad infinitum. These things feed each other until those left in a declining community are locked in. This has happened in a big way here, and while some of Wellston’s citizens have fled, others remain, bound there by family, lack of opportunity, and/or physical or mental disability. Still, whether or not the members of this community meant it, I did not feel welcome here. After several blocks, I finally turned left onto Page Blvd, a four-lane road heading east and west. I kept a quick pace, camera stowed, taking in the sights with my eyes instead. On my side of the street, house after house lay abandoned or ruined, with perhaps two out of five houses exhibiting no sign of habitation. This charming townhouse was an unprecedented exception; fresh paint, new fencing, landscaping and gardening, and even this charming gate to enter the property. This person had the motivation and the means to care for their home, and I really enjoyed pausing there and photographing it. One of the reasons I was excited to take this trip during this particular time of year was the changing of the leaves. It was perhaps twenty degrees cooler here than in Louisville, so their leaves had already undergone significant transition, unlike Louisville, whose leaves still held their summertime hue. I had lost my way over a mile back, but I knew that this was a major enough road that it would likely intersect with my next mark soon enough. Well, I hoped it would. My father’s recently finished his own novel; it takes place during the 1960s in a fictional town in Kentucky, and the main conflict arises between an established garage owner dealing with the competition of a brand new service station franchise across the street. He’d probably love these old pumps, their casings disintegrated, stolen, or salvaged away, revealing the mechanisms beneath. While in no shape for an antique aficionado due to decades of exposure, my dad would be all over it. He prefers things a little loved. This gas station sat at the corner of Park and Spring Street, and I thought I’d remembered seeing Spring Street on the map, so I shouldn’t be far. I kept going, knowing M. L. King Drive was to my left somewhere. I passed a Sav-a-Lot, took the first left, and there it was! I connected with it at an angle and kept my brisk pace. This neat old building was a bit of a diamond in the rough; pocketed windows, many of which had been smashed, an old marquee for a presumably defunct business, and unique architectural stylings. I assume that it was some sort of building contractor, as either side of their marquee claims they were “bonded” and “fireproof.” Research online revealed nothing, and given the practically identical state of this image from Google Maps’ image from three years ago, it’s probably been derelict for fifty years. The architecture suggests it was built sometime early in the last century. St. Louis has been in the news since August because of the shooting of Michael Brown. Ferguson, just a couple miles east of the airport where I landed this morning, has captured the core of the attention, but demonstrations and gatherings throughout St. Louis have been covered, too. Intriguingly, this was the first time I’d seen anything referring to the shooting. Regarding the shooting itself, I wasn’t there, but you cannot, in good conscience, say that things aren’t suspicious. Even if not a racially motivated murder, it’s clear that those in Ferguson and St. Louis at large recognize a distinct divide between police and their community, and race exacerbates that divide. Regardless, the overzealous, militarized police response was wholly unacceptable. Systematic discrimination is never out of the question, intentional or subconscious. All I can hope is that we find all the facts, and bless Mike’s family for all the hardship this has inflicted; I think Mike’s innocent. His community wouldn’t defend him so vehemently otherwise. All of a sudden, everything changed. A new fire station, a fancy new housing development, and a lovely park flanked me on every side. It was like a wave of money washed in from the Mississippi River over this part of town, and the crest stopped right here. It wasn’t all nice, but these were the newest buildings I’d seen in hours. This stand-alone townhouse had an interesting façade; on the left side, a stone face is clearly visible. Given the outside layer is brick (or faux brick), I originally thought that the stone was also fake, but a Google Maps check shows that, in 2011, the brick covered the whole façade, so it must have been damaged. From my angle, though, it looked intentional. 2Buk actually tags in Louisville, assuming 2Buk is a real person. Lots of road and interstate signs back home bear this mark. Unlike the mural I passed a couple hours ago with the Arch, this mural is colorful and vibrant. On the side of what I surmised to be a music store, this impressive painting was unusual in its subjects, as it seemed to cover random pop culture and daily life topics. But hey, I couldn’t have made it. The next couple miles were surprisingly boring. Long stretches between blocks and nothing but new, industrial facilities on either side, none of which were particularly photogenic, even for my tastes. I passed more people than I had all day, though, and all kinds, too. Families, a preacher, a disabled dad and his kid, a couple runners. The road had grown quiet now, as cars had little reason to come down this way on a Saturday. I had followed St. Charles Rock Road all the way until it turned into Dr. M. L. King Drive, and it had formed the backbone of the trip. It wasn’t until now that I realized that this same street bore me most of the way downtown. The buildings were getting taller, and the sounds of the city were growing louder. At my planned turn on 16th St., I finally bid my favored road goodbye for the last time. 16th St. seems like an arbitrary cut-over, and to most people it would be. However, I wanted to stop by my favorite place in St. Louis: the City Museum. For those of you who can’t actually discern what the Museum is from this angle, I’ll try to describe it for you. Imagine an adult playground made out of industrial scrap that also has nifty exhibits about the city where you literally climb and crawl from one room to the next. Outside the front area here, a smattering of old planes, twisted and smoothed rebar, and stone towers cover perhaps an acre of property where the only purpose is to climb, dive, duck, and slide your way around everything. When my wife and I visited St. Louis in 2010, this was our major destination on our second day. With big grins on our faces, we proceeded to spend the better part of the day experiencing the playground/museum, seeing shows and demonstrations, laughing, taking pictures, and having an all-around great time. Trust me, it may not make much sense on paper, but it’ll be a blast for you and the whole family. Just make sure to pick up some Advil; you will be sore the next day. I checked my watch and considered how far I had yet to walk and weighed it against the time I’d need to get my wife a souvenir. Checked my watch. Thought about my distance. Checked. How far. Ignored reason and went in anyway. Did not regret. The City Museum is right on the outskirts of what you might consider downtown, so there wasn’t much farther to go, maybe two miles or less. This was the home stretch. Downtown St. Louis was filled with lots of old factories and warehouses; our hotel the last time we were here was a converted manufacturing space. The downtown area was also fully stocked with Art Deco skyscrapers, like these three examples. There’s lots of modern buildings, too, though. Although these were enticing diversions, we’re on a mission, and my feet are about ready for a sit. Then I see this shot, like I’m sure they planned it. The building below the arch was St. Louis’s original courthouse. Now, it acts as part of the Jefferson Expansion Memorial, the entire complex that includes the Gateway Arch. It’s the tallest thing in the state, so I won’t miss it, but whatever you say, sidewalk! Lead on! Finally, after a solid five hours on my feet, I arrive at the entrance to the park surrounding the Arch. There’s quite a bit of construction, so pedestrian traffic has been routed all over to bypass the roadwork. In fact, I’d say that when you picture a tourist destination in your mind, the last thing you picture is it being surrounded by construction. However, almost without fail, there will be construction around it when you arrive. Try me on it, I dare you. I bet the next place you go, there’s nearby construction that reroutes you in your car or on foot. After arriving in the park, I made a beeline past mobs of tourists to meet my goal. At long last, I made it! Now, time for a good sit. I took five minutes and just relaxed. Nothing like a sit after five hours of basically power walking. And now, for a gallery of miscellaneous Arch shots! 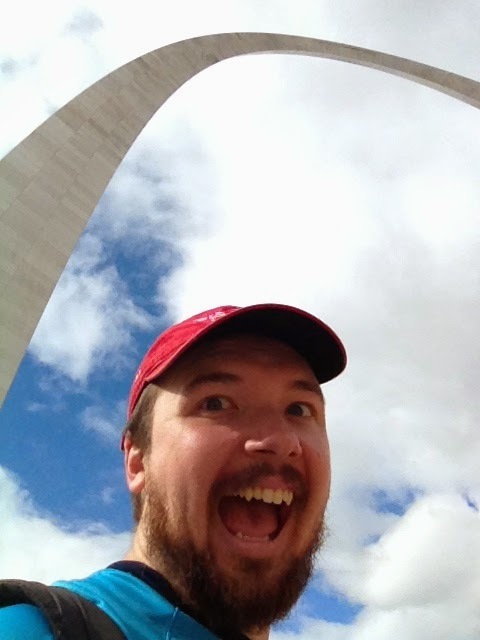 Come back next Wednesday for the final installment of my St. Louis trip!